Russia does not consider itself party to the conflict in Ukraine, seeing it as a conflict between the Eastern Ukrainians and the Kiev, while Poroshenko’s analysis of the situation is totally different, legal expert and blogger Alexander Mercouris told RT. RT:President Poroshenko has used some quite strong words to describe this meeting. Do you expect the fate of the whole world is really being decided in Minsk? And will it play a decisive role in ending the Ukrainian crisis? Alexander Mercouris: No, I don’t actually. I think this is an exploratory meeting between the Ukrainians and Russians which has happened after a great deal of international pressure and is probably to be explained to some extent by the deteriorating situation in Ukraine itself. The economy there is going very badly wrong, the military situation is not good, and this is having broader repercussions for Europe. So there is a push from various people to try and come to some sort of rearrangement, but I think to talk about this being the solution to a great crisis that is endangering the whole peace in Europe is to overdramatize the importance of this meeting. RT:Why do you think Vladimir Putin devoted most of his opening speech to economics, unlike his Ukrainian counterpart, who right away spoke about the conflict in Ukraine? AM: The fundamental difference is that the Russians do not consider themselves to be a party to the conflict in Ukraine. They see the conflict there as a conflict between the people in the Eastern Ukraine and the authorities who came to power in Kiev in February. So their analysis of the situation is totally different from the one of Poroshenko and of the people in Kiev who want to internationalize the question and turn it into a conflict between Ukraine and Russia. That is why you see a totally different approach from the two presidents. RT:Russia, the EU and Ukraine have a number of economic differences to sort out - gas, for example. Do you think this summit will end that deadlock? AM: The great problem with the gas issue is that Ukraine is in very heavy arrears on its gas. And I think what the Russians will be looking for is some commitment from Ukraine; I mean hard cash to actually pay off these arrears before they are prepared to compromise further on the gas price issue. The problem is at the moment that Ukraine has very little, if any, money left at all. Partly because it has been using the money it has been getting from the organizations like the IMF to fight the war in the east instead of stabilizing its economy. 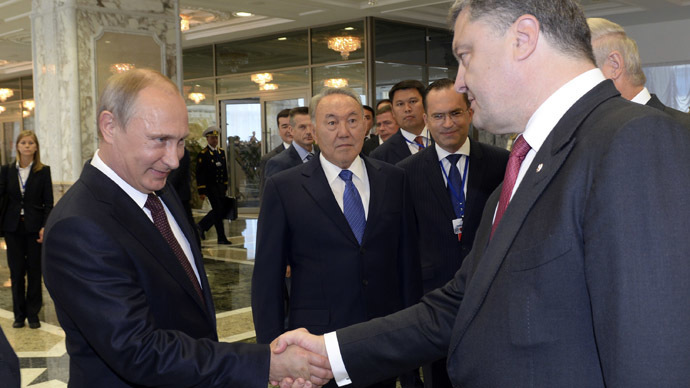 I am sure that Mr. Putin in private discussions that he is to have with Mr. Poroshenko is going to point that out. RT:Before the summit, the German Chancellor said that Ukraine has to strike a balance between its European leanings and good relations with Russia. We've heard President Putin say Russia will have to end preferential treatment of Ukraine should it strike a deal with the EU. Can Ukraine really play both sides after that? AM: The trouble with this is that it might have been possible once, but it is going to be very difficult now because first of all, the EU Association Agreement to which Ukraine has now committed itself frankly closes off this option, it makes Ukraine part of the European single market, and it is very difficult to see how Ukraine can simultaneously continue in the previous trade arrangements that it had with Moscow. Secondly, doing that also totally flies in the face of what the whole Maidan movement in Ukraine had been about, this is to turn away from Moscow and towards Europe. So to say now, after all that has happened over all these months, all the violence that has been in Ukraine, that maybe after all Ukraine needs to find a balance between Russia and the EU, is very late. And probably, in my opinion, too late for that to happen.